Design Art has won the 2015 WCMA Best Style Concept Honorable Mention award and Design Journal's Best of 2015 Editors' Choice award for SwissCrystal-On-Wood. Our SwissCrystal collection features 16 styles of beautiful 24% lead hand-cut crystal. Each comes with a standard base, but may be paired with Petite, Classic or Sculpted decorative bases. View all the awards at WCMA and Design Journal. 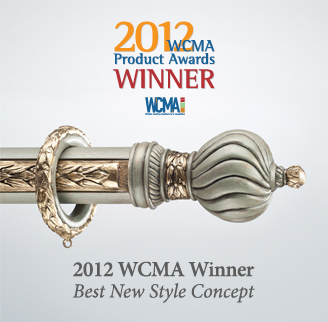 Design Art has won the 2013 WCMA Best New Technical Innovation award for our finial adaptor system. With our adaptors, 1-3/8” pole finials will fit 2” or 2-1/4” poles while 2” or 2-1/4” pole finials will fit 3” poles. View all the awards at WCMA. for our Inlay Design Rods and Finials. View all the awards at WCMA.